Should my bold prediction to start this article come true, Kershaw will be the first pitcher to win three Cy Young Award’s before his 26 birthday. This season he became the first pitcher in history to lead the league in Earned Run Average for four straight seasons. He threw his first no hitter, with a modest 15 strikeouts and no walks, which was widely considered one of the greatest games ever pitched. His unbelievable season was one that saw him miss the entire month of April due to injury. In his five starts in May, he went 2-3 with a 3.57 ERA. Uh Oh. Was Kershaw not the same? Was he pitching injured? Did the Dodgers just waste 215 million dollars? The skepticism was silenced quickly in June and July when Kershaw started 11 games, winning them all, giving up only nine earned runs in the process (remember those 9 earned runs a little bit later). He ended up winning 13 straight games, losing only one game after May 28. 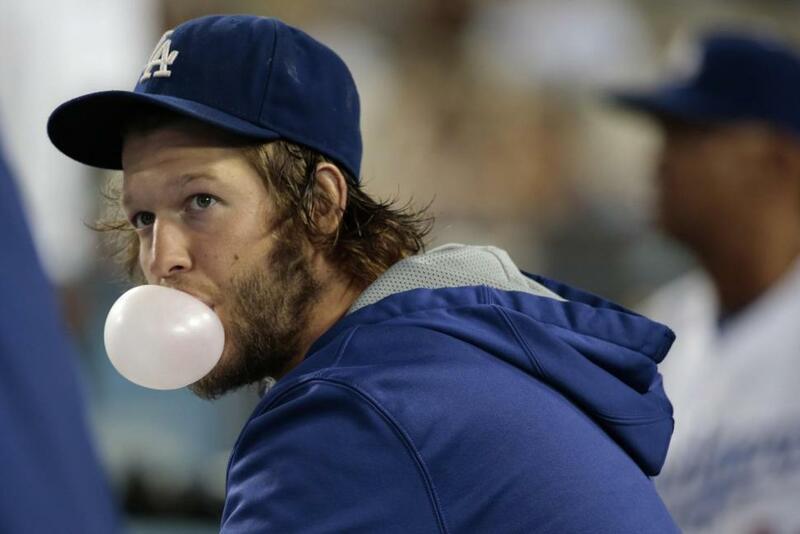 The season ended and Kershaw finished with a record of 21-3 with a 1.77 ERA. He lead the league in WHIP, throw in six complete games and Clayton Kershaw’s career 2.48 ERA is the lowest in the live ball era (which began in 1920). Vin Scully wasn’t even born for seven more years. But you need more than one great pitcher every fifth day to be a good ball club, and the Dodgers were indeed that. They won 94 games, good for second place in the National League. Zach Greinke could be argued as the best No. 2-pitcher in the game. Yasiel Puig, for all his antics, had a very solid sophomore campaign and did not slump like many people (including me) thought he would have. There was no drama to end the regular season, as the Dodgers won the division by six games over the San Francisco Giants. Despite a successful season there were two things looming over Dodger Stadium before Game 1 of the Division Series. Kershaw’s postseason record was 1-3 with an ERA over 4, and how would they fair against the team in the other dugout, the St. Louis Cardinals. The Cards were responsible for two of the three Kershaw losses in last year’s NLCS, when the Dodgers fell in 6 games. That was last year, and the formula for the Dodgers this year seemed relatively simple: win both games with Kershaw, and win one of the other three and it’s off to the NLCS. And for all their prowess the last decade the Cardinals flat out did not hit this season. Kershaw could probably make the 1927 Yankees look bad. The 2014 Cardinals scored 10 less runs than the Mets this season. This shouldn’t be so hard. And it wasn’t for the first six innings of Game 1. Other than two solo home runs, Kershaw didn’t allow another base runner. The Dodgers lead 6-2 going into the seventh, and you feel as safe as when you’re a little kid and your mother tucks you into bed. But for all the praise that we give Kershaw and the other great players, the game still must be played on the field. The Cardinals woke up, Kershaw started missing location, and to the shock of us all the Cardinals were now in the lead just like that. Stunning. Improbable. Whatever words you want to use. Clayton Kershaw gave up nine runs in June and July. He just gave up eight runs in less than seven innings. More shocking was the fact of how the game changed in a blink of any eye. Probably the stat that sums it up best is Kershaw became the first postseason pitcher to start a game, walk none, strike out 10 and lose. The Cardinals’ October magic was back and the Dodgers were watching the same painful movie they saw last year. This was just act one. The two teams split the next two games, leaving Dodgers manager Don Mattingly with a decision: start veteran Dan Haren, or start the best pitcher on the planet to save the season on three days rest. I’m normally not a huge believer of starting a pitcher on three day’s rest, but in this case Mattingly had no choice. Kershaw took the hill to win and get the series back to L.A. for a Game 5. The movie started pretty much the same. The Dodgers were winning after six innings and Kershaw was as good as can be giving up one hit and two walks while striking out nine. The Dodgers were up 2-0 going to the bottom of the seventh. Struggling outfielder Matt Holliday started with a soft single up the middle. Jhonny Peralta followed with a hit even softer than Holliday’s. Here we go again. He’s starting to unravel. The bullpen is ready. What’s Don Mattingly going to do? He didn’t move from his spot. Two softly hit balls was not going to be enough to force Kershaw out of the game. In steps Matt Adams, the former Division II player of the year. First pitch: strike. The next pitch was a hanging curveball. No need to worry. No lefty had ever hit a home run off Kershaw on a curveball. Ever. Adams squared it up, flipped his bat after making contact, and that hanging curveball landed in the Cardinals bullpen putting the Busch Stadium crowd in sheer delirium. The Cardinals now lead, 3-2. I sat on my couch with my mouth open, unable to find words. This made Games 4 and 5 of the 2001 World Series look ordinary. I was shocked along with the entire baseball world aside from maybe the Cardinals in the dugout, and even that I question. The Cardinals went on to win the game by the same score, taking the series in four games. Clayton Kershaw’s numbers in two starts against the Cardinals: 0-2 with a 7.82 ERA, amazingly more than a point higher than his ERA in two starts against them last year. Twelve innings of dominance and 2/3 of an inning of almost incomprehensible unraveling. Clayton Kershaw has lost four straight post season starts. He lost three all this season. It’s pretty incredible how other quality left handers like Andy Pettitte or Jon Lester have fared way better in the post season, and have never had a year even close to Kershaw’s. Madison Bumgarner might never give up another run in the post season again. But these guys aren’t Kershaw. Nobody is. He’s the best at his position, and it’s not even close. Which makes his demise in the playoffs even more haunting. People felt bad for the guy. A good guy who, along with his wife Ellen, went to Zambia in 2012 where they built an orphanage. Who knew he could better off the field than when he is on it? So when Clayton Kershaw wins his third Cy Young award, what are people going to remember? His regular season for the ages that featured one of the greatest pitched games of all times, or will they remember Matt Adams flipping his bat as he and the Cardinals celebrated because they just beat the best… again. This entry was posted in Home, MLB, Pinto's Pick Off and tagged Clayton Kershaw, Cy Young, Kershaw, Los Angeles Dodgers, Postseason, the Dodgers. Bookmark the permalink.